As we prepare to sit down with Yann Bourigault, export director at Duboeuf Wines, I felt it reasonable to share some fun facts on Beaujolais and in particular, Beaujolais Cru. 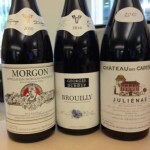 For those of you interested, Wine.com will be hosting a virtual tasting with Mr. Bourigault tomorrow (4/3) at 5pmPST/8pmEST as we taste through a delicious line up of Duboeuf Beaujolais Cru from the outstanding 2010 vintage. Where is it? Beaujolais lies at the southernmost point of Burgundy where about 50,000 acres of vines are planted. About 30 miles long and 8 miles wine, Beaujolais can be compared to Napa Valley in size. What grape? The primary grape variety here is Gamay, a very light bodied grape that does will with the soils and climate of the region. Gamay is actually a cross between Pinot Noir and Gouais Blanc, a white varietal. Perhaps that’s why it’s often called a white wine that happens to be red. 98% of Beaujolais is planted with Gamay. What are the soils and climate like? The region can be split into two parts – north and south. In the south, the soils are clay-based and the land is flat, while in the north, there are rolling hillsides and the soil is a base of granite and schist. What is Beaujolais Cru? There are 10 Crus in Beaujolais. These “Cru” are basically villages or sub-regions within Beaujolais that produce some of the best and most distinctive wine of the region. The Cru villages are primarily located in the northern part of Beaujolais, with the rolling hillsides and granite-based soils. Cru Beaujolais creates wines with more structure, more complexity and more aromatics than the more widely produced AOC Beaujolais and AOC Beaujolais-Villages from the south of the region. The 10 Cru include: Brouilly, Morgon, Moulin-a-Vent, Fleurie, Julienas, Cote de Brouilly, Saint-Amour, Regnie, Chiroubles and Chenas. What is Beaujolais Nouveau? Beaujolais Nouveau has a very short fermentation process using carbonic maceration, so it is released in the November after harvest (just a few months after the grapes are picked). It is light, fresh, fruity and fun. Perfect for Thanksgiving and meant to be consumed immediately! What is Carbonic Maceration? To put an involved chemical process very simply, it’s where the fermentation happens anerobically rather than arobically – basically, inside the grape without oxygen. The grapes are not pressed as most grapes are to begin fermentation. Instead, whole grape bunches are put into a large tank. The grapes on the bottom are pressed by the weight of those grapes on top and once opened, begin the normal fermentation process, which releases carbon minoxide. In the enclosed tank, the CO2 wafts up to those whole berries, seeping into the skin and causing the grapes to undergo fermentation inside the berry. The result is very juicy wine with very little tannins. This process works with very few wines, but with Gamay, it’s a winner. Some of the higher end wines (like Cru Beaujolais) use less or no carbonic maceration. Drink Beaujolais with a juicy burger, a gourmet pizza or roasted poultry. They are great food wines due to the acid and fruit structure, and completely underrated. We hope you’ll join us tomorrow to learn more! Cheers! Still loving California, but growing more adventurous! The customers of Wine.com were California Dreaming in 2010, according to the numbers – the region topped our list of most bottles sold and came in with about 40% growth. And why not? California represents some of the most delicious wines in the world, from value to collectible, and the diversity of varieties is so broad, it pleases a Pinot lover as well as a Zinfandel fanatic. That said, we still saw a lot of Napa Valley purchases – that region’s growth was up 92%. Guess that goes with the numbers that show Cabernet Sauvignon was the number one grape variety as well. 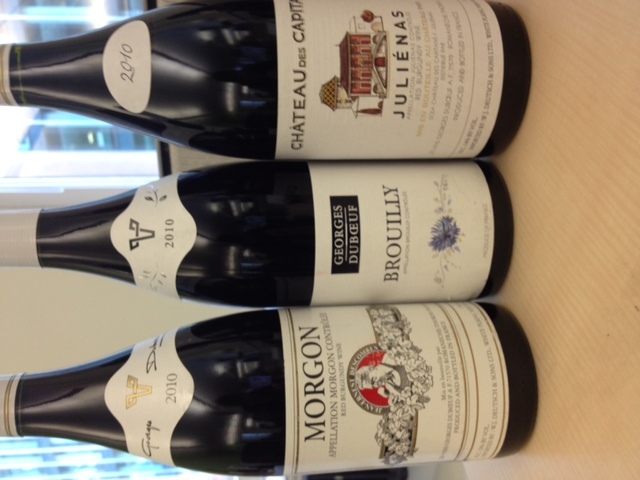 But beyond the California borders, we’re excited about what other regions people are trying, like Beaujolais. Often associated with only Beaujolais Nouveau, drinkers are discovering the delicious diversity and quality of Beaujolais Villages and Beaujolais Crus. Not to mention, 2009 was a fantastic vintage for the region, so great wines at great values were good for all. Bordeaux was also up – another region that enjoyed the 2009 vintage. Portugal came in third at 79%, and that was not just for Port. Dry reds from Portugal, as well as refreshing whites, are finally getting the recognition they deserve. South Africa rounded out the top 4 growth regions – maybe a World Cup boost? So it looks like 2010 was a year of both traditional drinking and adventurous tasting. We look forward to what 2011 brings! ‘Tis the season for Beaujolais! Not just the recognized Beaujolais Nouveau that appears on store shelves the third week of November and is gone from said shelves (or should be) three months later. Though this fresh and fruity version of Beaujolais has its place in the wine world, it’s not everyone’s cup of tea, and it does not represent the majority of Beaujolais. The region of Beaujolais is situated in the southern part of the Burgundy appellation in France. Surprising, since Beaujolais differs from Burgundy in many ways, including soil type, climate and grape variety. The primary grape of Beaujolais is Gamay Noir, a very light-skinned grape that produces wines of light body, fresh fruit, great acidity and low tannins. The grape grows on granite and schist soils of the area and the climate is classified as semi-continental – more similar to their southern neighbor, the Rhone Valley, than the rest of Burgundy to the north. Most (over half) the wine of Beaujolais is sold under the basic Beaujolais appellation. This style of wine is quaffable, juicy stuff with low alcohol and pretty much zero tannin. The next level of wine is Beaujolais-Villages, made with grapes from higher quality vineyards. Finally, you have the Beaujolais Crus, the 10 regions of the area that make the top-notch Beaujolais. There is white wine made here, though the percentage is small and it can be hard to find, but worth a try if you do. Beaujolais Cru is why I love Beaujolais. Wine from these 10 communes contain that juicy fruit I love about Gamay, but with some extra depth – the palate has great acidity and low tannins typical of Beaujolais, but with a slight richness that distinguish Beaujolais Crus from other Beaujolais. Best part, these wines come in under the $20 mark (most of the time). The 10 crus are: Morgon, St-Amour, Julienas, Chenas, Mounlin-A-Vent, Fleurie, Chiroubles, Brouilly, Cote de Brouilly and Regnie. So give Beaujolais Crus a try – it’s known as a classic for the Thanksgiving table, and I have tasted it recently with a spicy pasta dish that was a fantastic match. It’s also great with a burger or pizza. However, we did discover that it tastes metallic when paired with carrot cake, so do avoid that pairing! It’s summertime, and the drinking is easy… and more often – we’re sipping wine during the day at BBQs and parties, in the sun and occasionally out of a plastic cup. I think of wine as seasonal and this is the season for crisp whites, juicy reds, and of course, the ultimate summer drink, rose! A good number of these wines are ideal for summer’s most popular container – the plastic cup. Sauvignon Blancs – Sauvignon Blanc is a perfect summer wine, particularly on those very hot days. They are excellent when served superc old, and their acidity is so deliciously refreshing. It makes a day gone bad become good. Chile and New Zealand are doing some excellent wines right now- some of my favorite producers include Santa Rita Floresta & Seresin. Rosé – I am a rose junkie. From about April to September it’s what I like to keep constantly stocked in the fridge. Just can’t get enough of the dry pink drink. Crisp and refreshing like a white wine, but with lingering characteristics of the red wine it never became. California, Australia, South Africa and France are my favorites for dry rose. For specific producers, check out Mulderbosch, Bonny Doon, Chateau d’Aqueria, and Angoves. Riesling – Riesling is too often overlooked because it’s the feared “sweet” wine. Not in every case! Not even in most cases. And the wines that are slightly sweet are balanced by a searing backbone of acidity, which gives it balance – something a good white wine needs. Add this to the reasonable alcohol level and you’ve got a perfect wine for BBQ food and long days in the sun. Try Pewsey Vale from Australia or Dom. Schlumberger from Alsace. Off the Beaten Path Whites – I love cool and different grapes, like Albariño, Torrontés and Grüner Veltliner. Try something new if you have not yet done so, as you’ll be pleasantly surprised. Beaujolais – Juicy is the best word to describe Beaujolais. I like to serve it slightly chilled and it goes great with lots of food styles. Duboeuf is a classic producer of Beaujolais. Rhone Reds –Rhone wines are great all year round, but they are delicious for pairing with anything off the grill, which makes them perfect summer reds. The Delas St-Esprit CDR is particularly good. Zinfandel – Jammy and fun, Zinfandel is the typical wine for BBQ. It’s got the fruit, spice and tannins to match all that spice & sauce. Just watch the alcohol, it can be dangerous… Some great Zins are made by Murphy-Goode, Kenwood and Ridge.